Varicella zoster virus (VZV) causes primary infection (chicken pox) and reactivation (herpes zoster). Chicken pox in children is usually self-limiting with cerebellitis as the most common neurological complication. However, in adults, VZV can cause serious neurological complications. The mechanisms responsible for neurological manifestations have been attributed to direct neurological damage, immune mediated and, recently, due to infection of the blood vessels by VZV (VZV vasculopathy). Published Indian data on chicken pox-associated neurological complications are very sparse, with only a few case series ,, mostly limited to children. Hence, we have carried out this study to specifically look for chicken pox-associated neurological complications in adults. This was a retrospective study of all patients (aged 13 years and above) admitted over 2 years. The patients with herpes zoster complications were excluded. Case records of 20 patients were included in this study. This study was carried out with after obtaining approval from the Scientific Advisory Committee and the Ethics Committee of the Institute. There were 20 cases in total. The male:female ratio was 17:3. Out of the 20 patients, 13 patients had active lesions at the time of development of the neurological complications. The neurological manifestations were as follows: Encephalitis (10), cerebellitis (4), cortical venous thrombosis, (4) and arterial stroke (2). 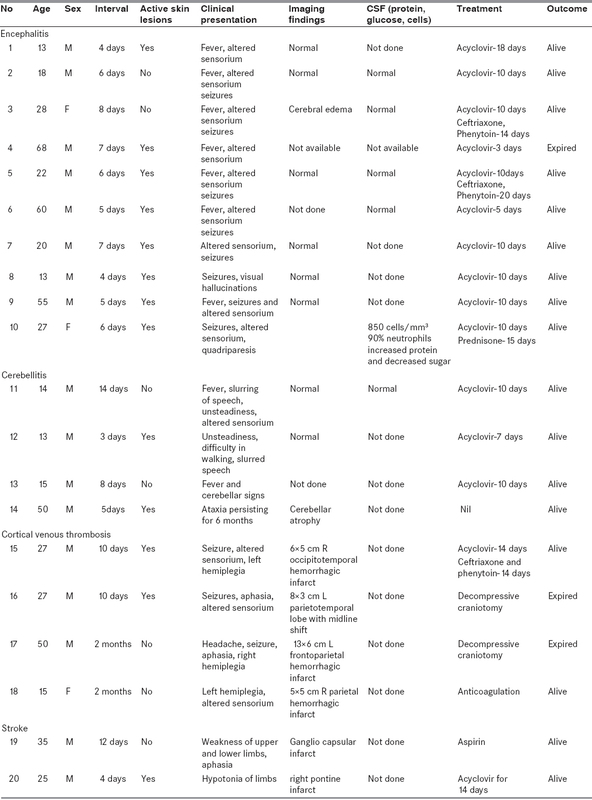 The clinical manifestations, investigations, and outcomes of these patients are presented in [Table 1]. Encephalitis was seen in 10 patients. Mean duration of presentation from the onset of skin lesions was 5.8 days, and 8 patients had active skin lesions. All patients received acyclovir. The oldest patient died and the rest recovered without any significant deficit. Ataxia was seen in four patients. All developed ataxia within 2 weeks of onset of skin lesions. One patient had persistent ataxia and the rest improved. Cortical venous thrombosis was seen in four patients. Two patients presented 2 months after chicken pox. All the four patients had extensive sinus thrombosis and two patients died due to massive infarct. Two patients developed arterial infarcts. The first patient presented within 4 days of skin lesions and imaging showed pontine infarct. The second patient presented 14 days after the onset of rash and computed tomography (CT) showed ganglio-capsular infarct. We did not come across any cases of Guillain-Barré syndrome or Myelitis in our study. Based on our study, we conclude that encephalitis might be more common in adults as compared to cerebellitis that is predominantly seen in children. We hope that this series will be of help for clinicians who treat adults with chicken pox. Whitley RJ. Varicella-zoster virus infection. In: Longo, editor. Harrison's Principles of Internal Medicine. 18 th ed. New York: McGraw Hill Publisher; 2008. p. 1103. Johnson R, Milbourn PE. Central nervous system manifestations of chickenpox. Can Med Assoc J 1970;102:831-4. Gilden D, Cohrs RJ, Mahalingam R, Nagel MA. Varicella zoster virus vasculopathies: Diverse clinical manifestations, laboratory features, pathogenesis, and treatment. Lancet Neurol 2009;8:731-40. Paul R, Singhania P, Hashmi MA, Bandyopadhyay R, Banerjee AK. Post chicken pox neurological sequelae: Three distinct presentations. J Neurosci Rural Pract 2010;1:92-6. Murthy JM, Kishore TL. Neurological complications of chickenpox: A clinical, electrophysiological and MRI study. Neurol India 1996;44:195-201. Girija AS, Rafeeque M, Abdurehman KP. Neurological complications of chickenpox. Ann Indian Acad Neurol 2007;10:240-6.